Any contribution, large or small, is a gift that benefits you, the Opera House, and the community. No matter if you are an individual, a small business, or represent a large corporation, we offer many ways to give back to a resource you depend on. Sign up for the level of your choice online or by calling the box office at 802-476-8188. Membership includes our quarterly newsletter, early bird discounts on Celebration Series tickets and BOH special events, and notification about all upcoming BOH events. All of the above plus two tickets to a Vermont Philharmonic performance throughout the season. All of the above plus invitations to all private receptions throughout the year. All of the above plus two tickets to any performance throughout the season. All of the above plus dinner for two at Sarducci's Restaurant in Montpelier. Coupled with the complimentary tickets this makes a wonderful evening out, sampling regional culinary, and performing arts. All the above plus a secret gift! Past gifts have included framed reproductions of historic photos, posters and playbills. 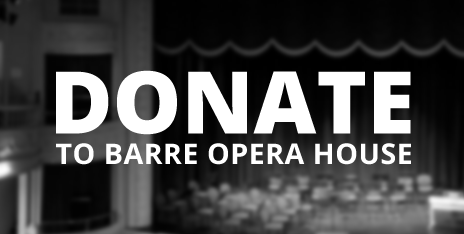 Other ways to support the Barre Opera House can be found on our "Donate & Other Ways to Give" page.